Every now and then I get contacted by a brand that I honestly had never heard about before they reached out to me. 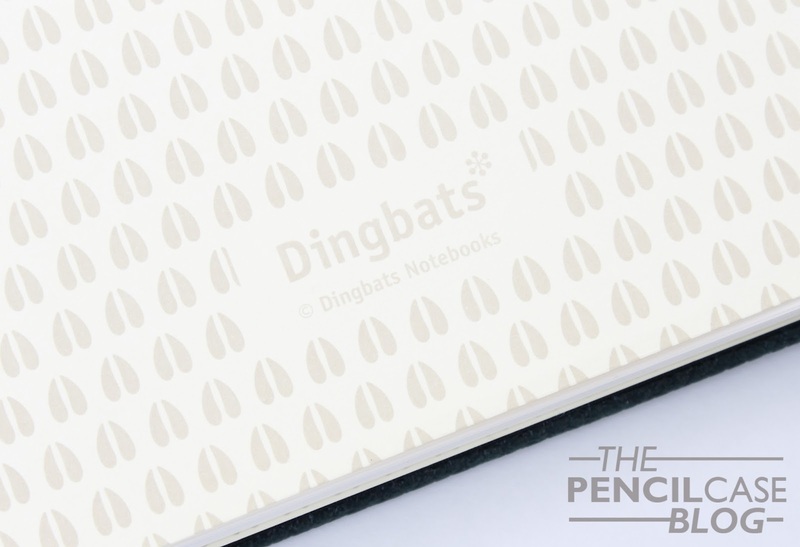 Today we're taking a look at one of those, and they're called Dingbats (quite an interesting name to begin with!). The company itself has a lot of history behind it, with the grandfather of the current owner being one of the first paper merchants in Lebanon. In that legacy, he now runs Dingbats, and produces handmade notebooks. It's always nice to have some backstory behind a brand, especially if it shows a rich history of passion for their products. Reindeer hoofs decorate the inside cover paper. So they sent me one of their notebooks from -what I suppose is- their main line of products called Wildlife. 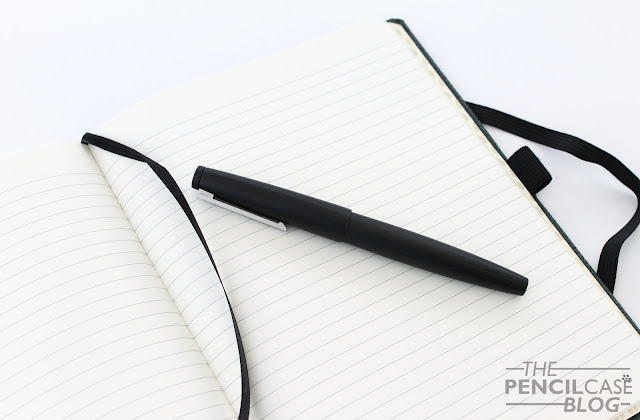 It's an A5-sized notebook with a PU (polyurethane) faux-leather cover, and is decorated with an embossed animal silhouette. 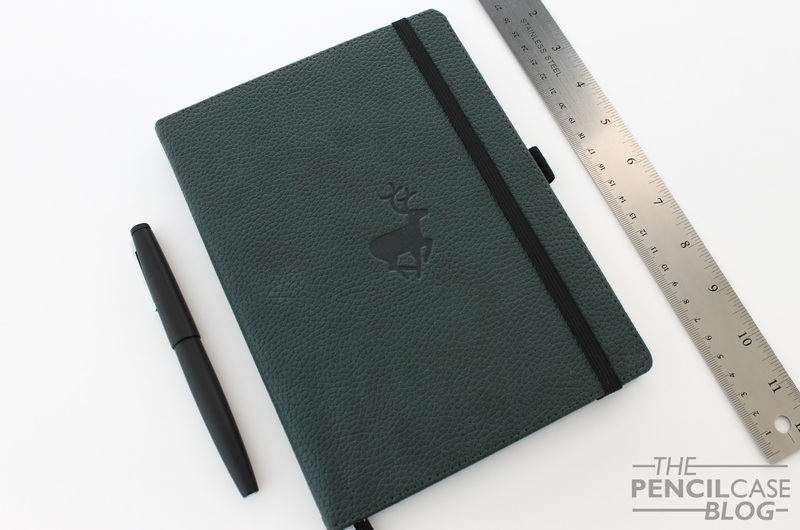 They have a couple different colors available, all with a different animal theme (in this case I received a green notebook with a reindeer embossed on the cover). The attention to detail is what immediately spoke to me, and you can clearly see the work and thought involved in the process of making these notebooks. A cool example is the cover paper on the inside of the cover, that has a reindeer footprint printed on it (see the picture above)! The green leather cover is stitched all the way around in matching green thread. On the inside of the back cover, you can find a pocket to hold loose paper or cards. The page marker, pen loop and elastic closure are all black, which compliments the green cover nicely. The design of the Wildlife notebook is definitely what I love most about it. It's different, has a lot of small details that make it stand out, and it's very well put together. The inside counts 92 sheets of smooth cream-coloured 100gsm paper in either lined, plain or graph. 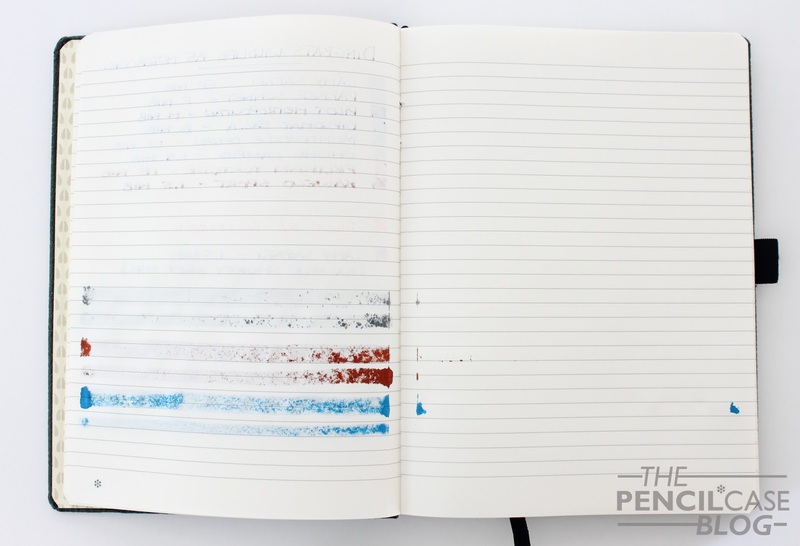 Another cool feature here is that all 92 sheets are perforated, so you can take out whichever page you want without destroying the notebook. The pages aren't numbered, but instead the Dingbats logo (which I assume represents a stylised flower?) is printed at the bottom of each page. 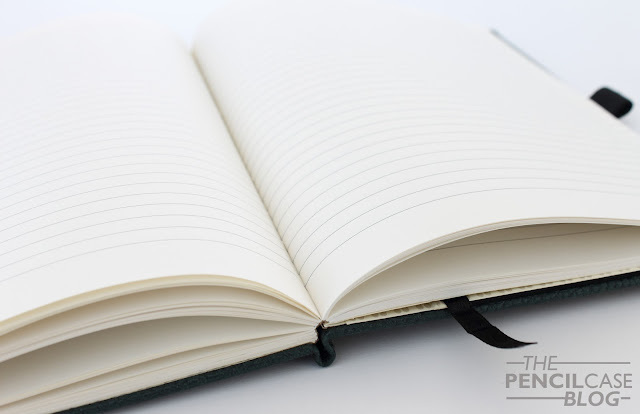 The binding is supple, and allows for the notebook to lay open pretty flat. Now as for the paper quality... I have quite a hard time finding notebooks that really hold up to fountain pens like I think they should. 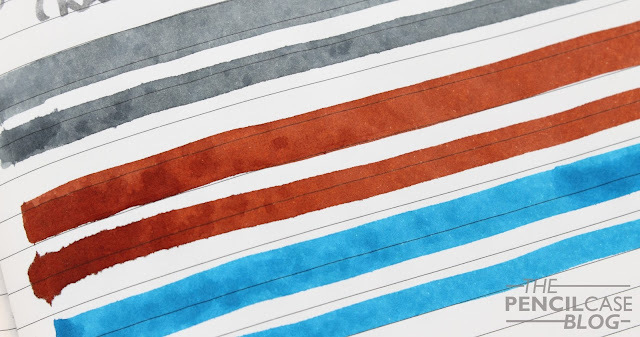 It's not difficult to imagine why paper quality is no longer the most important aspect, when most people nowadays tend to stick to ballpoint or pencil anyway. 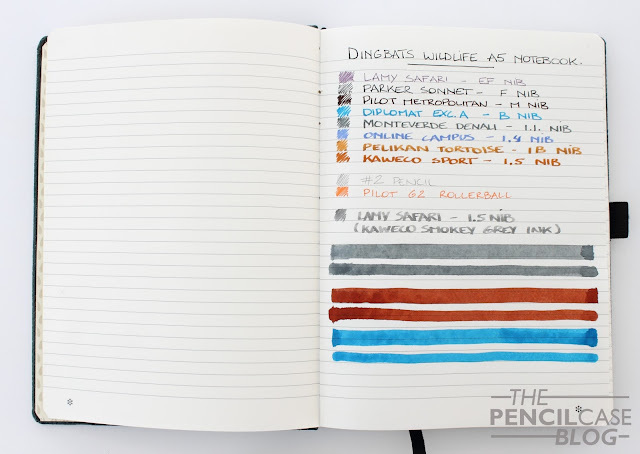 But of course I do still write a blog focused on fountain pens, so I threw everything I had at it to see how well it held up... The results are mixed: Extra-fine, fine and even drier medium nibs are ok. I could see some bleedthrough when I used a wetter medium nib. Wider nibs started bleeding through, although not as much as I would've expected. Ink swabs with a 10mm calligraphy dip nib (lays down A TON of ink, much more than even the wettest fountain pen) were too much for the paper to handle, and it bled through the paper, onto the page behind it. As far as feathering goes, results varied based on the ink used, but in general it wasn't that bad. I could find some spreading around the letters, but real feathering wasn't really an issue, not even with the ink swabs. Rollerball, and ballpoint pens performed fine. I could see some ghosting on the other side of the page, but nothing outrageous. The paper is quite smooth (part of the reason why it handles fountain pen inks quite well), so it's not perfect for pencil users, although I found HB lead to give quite decent dark lines. The paper held up better than I expected. It's not perfectly fountain pen friendly, but it can handle finer nibs without too much trouble. The safest option would of course be to stick with rollerballs or ballpoint pen, they shouldn't cause any issues. A5+ size means it's a bit bigger than a Leuchtturm A5 notebook, which in turn is wider than a Moleskine Large Cahier. All in all, I think the people at Dingbats created quite a nice notebook. 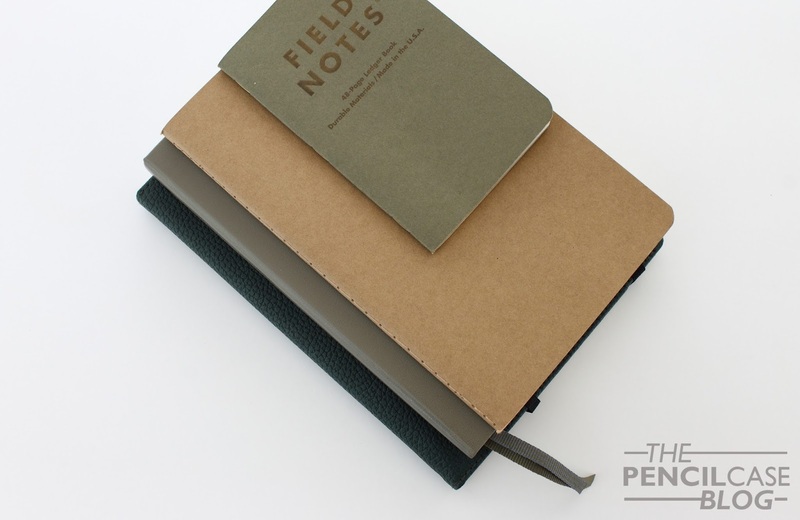 The design is refreshing and the notebook is made with attention to detail. Performance-wise, it might not be on the same level as Tomoe river or Leuchtturm, but in my experience only very little can hold up to those standards. 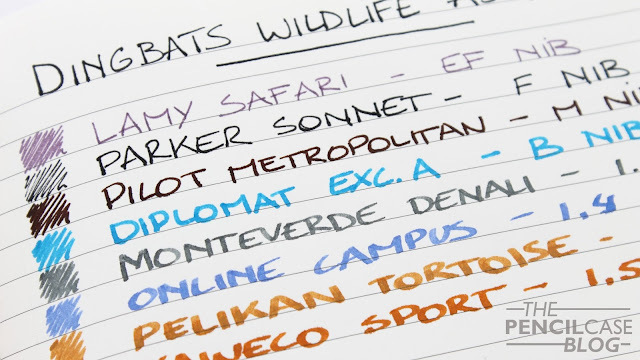 It's perfect for rollerball or ballpoint use, but even with fountain pens it can hold its own. Another positive is the price point at which these notebooks sell. The Wildlife notebooks come in three sizes: A4+, A5+ and a reporters notebook, and start at 12.9EUR (13.5USD). The A5+ size that I reviewed here, costs a reasonable 17.6EUR (18.4USD), which is about the same as an A5 Leuchtturm notebook. Products can be bought directly from their website, dingbats-notebooks.co.uk, or Amazon. Note: I received this product free of charge from Dingbats, so I could write this review. I was in no way influenced in the making of this review, the opinions shared in this review are completely my own! This post does not contain affilate links. This is a useful blog. The way of writing is good.It has some valuable content on this topic. Thank you for compiling it into an easy to read and well written post. Can you confirm how wide the lines are? They're marketing material doesn't say, and when I asked a question on Amazon I just got replies from fools saying "Sorry, I don't have the lined one". The line spacing is 6mm, so fairly average I'd say. Sorry for the super-late reply! © pencilcaseblog.com 2016 All Rights Reserved. Powered by Blogger.